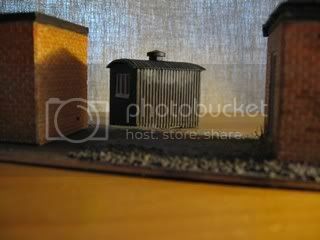 ...but I have at least got started, with one very lonely building! I had a layout when I was a kid, I guess more than 20 years ago, that my grandfather built for me. 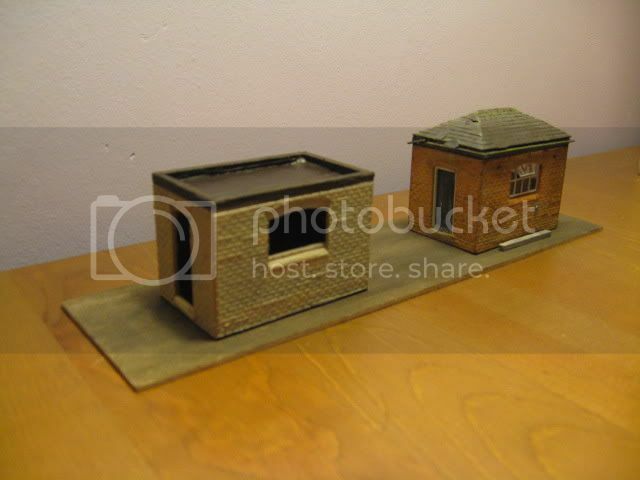 I never did any building on it, so this is really my first attempt at modelling (other than the odd Airfix kit even longer ago). Seeing my friend Andrew's (known as Grotland here) layout sparked my interest in scratchbuilding. 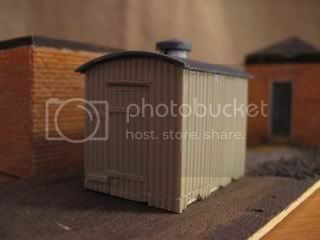 It's just a small 4mm scale building/ shed thingy (I know next to nothing about railways) based on a photo I found on a website. I used Wills slate (which I butchered so much I maybe shouldn't have bothered) and brickwork. Everything else is bits of matchstick, balsa, styrene strip, card, etc. 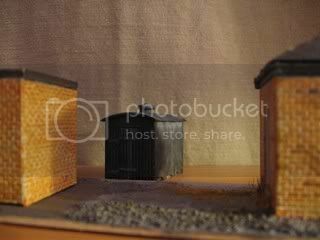 In future, I intend to check out what window kits and other bits and pieces are available, especially for brickwork above windows (which I found a bit of a pain to make out of balsa). Last edited by Dead Man's Handle on Sat Jan 24, 2009 2:16 pm, edited 2 times in total. Dole scrubbers build 'em best! That is a great job you've done there. I started my layout last November and progress is really slow. Ive often thought would it have been better to do some thing small and just expand a bit at a time. Modules or a diorama maybe. Any way well done Ade. See my thread on personal layouts "It's a holiday park with no name"
New name for layout now found. Chufferlands Holiday Park. Very nice work, especially for a first attempt. 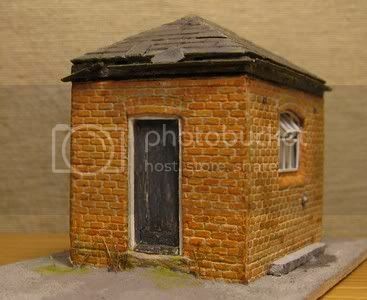 Thats amazing especially the weathering and aging on the bricks and drain pipe and the windows how do you have the patiance? Big Al - I have a plan I'm working on for a fairly big layout, but I intend to split it into modules somehow so I'm not too overwhelmed As I haven't firmly decided anything yet, I just wanted to make something that could really fit anywhere in order to see if I could get decent results and if I actually liked doing it. SouthernBoy - I definitely intend for it to be railway led - My current plan is fairly track 'heavy'. I'd like to get started on a station building or a signal box, but I guess those will be rather dependant on my final plan and the approximate region my layout is supposed to represent - I still can't decide on that, so I think I must make my mind up soon The building above is based on one at Barnetby station which I thought I could fit in anywhere, even if it means repainting the bricks a different colour (they're actually more orange than they appear above in the very artificial light). 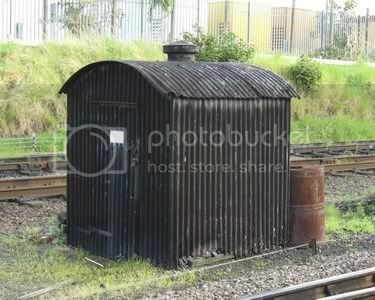 1 lonely shed makes one home sick! I'm not sure yet about Slaters vs. Wills - I still haven't had a go with the Slaters to see how it turns out for me. Ade that building looks ace. Better than the real thing especially since they have both been bulldozed quite recently. An inspection of Barnetby Station on Google Earth shows them quite plainly to the north of the line near the car park more recent photos show them gone leaving only the bases. You can just see them above the DMU on the picture. Shame you could have taken a trip out there and had a snoop around. Will your next project be the buffer stop a few feet away? Extended the height a few mm (as you can see from the crude joins shown in the photos). 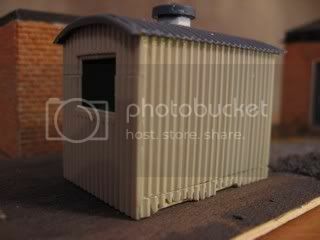 Extended length of the roof so it has an overhang (the kit was more flush and I didn't like the way it looked). Removed part of the window frame (to replace with vertical frames). Cut out the door to hang it from the other side (not sure why, just preferred it! and to make it less recessed). Changed the hinge design so the mountings are visible on the 'wall' part. Raised the height of the vent thingy and increased the diameter below the top bit. 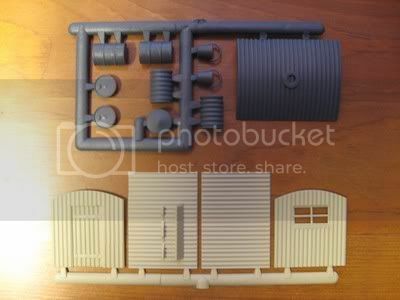 Seeing as you don't have a layout or plans yet - will you experiment with building in other scales - or are you set on 00 ? And any thoughts on a space for a layout or anything else layout related yet ? 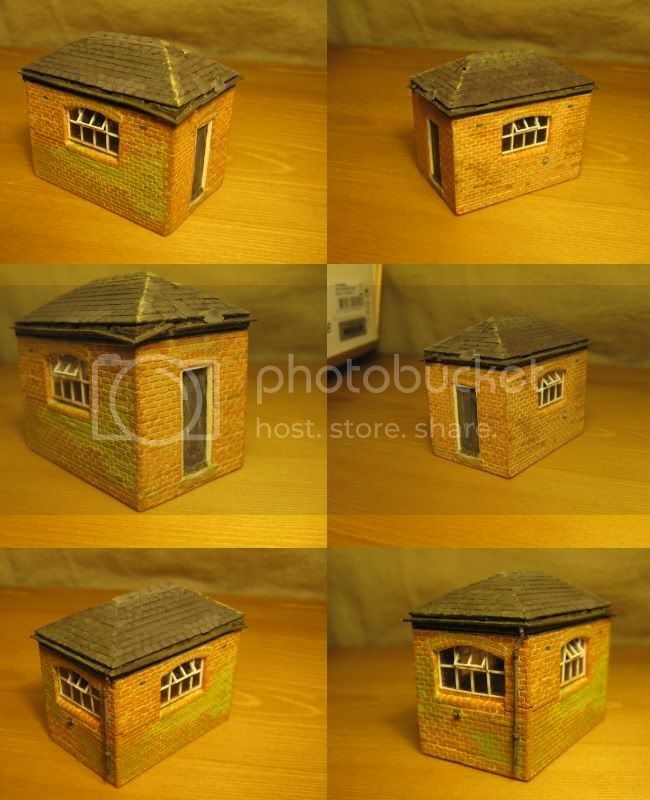 A cottage industry is a lovely idea, but if I paid myself minimum wage then I'd have to somehow find people who are willing to pay Â£200 for a lineside hut! Unfortunately things are very 'up in the air' at the moment regarding work and where I might be able to afford to live, etc... so filling a room with a layout right now probably isn't the best idea (hasn't stopped me tayloring the plan to fit around the chimney breast where I am now though... hehe.) The idea at the moment is to start with a smallish section, once I've worked out how to split things up.